This new Armageddon Edition comes complete with all the information contained on the origianal DVD + some killer bonuses! 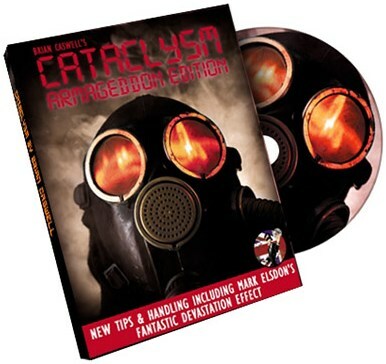 And as an added bonus and with kind permission Mark Elsdon has included his incredible follow up to Cataclysm call Devastation. From the creative mind behind the best selling card effect Trilogy comes what has been called Brian Caswells greatest creation ever! Cataclysm Imagine showing a deck of Bicycle brand playing cards each card has a number written on the back. Your spectator names 3 playing cards and these are removed from the face up deck and placed on the table. A photograph is shown to contain 3 face down playing cards each bearing a different number on their back. Unbelievable as it sounds when the cards are turned over the numbers match!!!! Yes it really is that clean! You will absolutely love Cataclysm! It really is the cleanest effect of it's kind. Requires a regular Bicycle deck (Red).